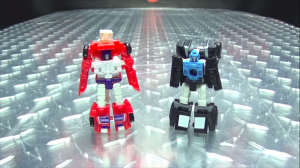 Thanks to a heads up from Seibertronian Kanrabat, we have word that popular Youtube creator Emgo316 has uploaded reviews for the upcoming Wave 2 Micromasters! The wave 2 Micromasters consist of the Spy Patrol, which is Laserbeak and Ravage, designed to act as shields/tapes while still fitting in voyager Soundwave's chest, and the Rescue Patrol, which features Red Heat and Stakeout, fresh off of his claim to fame from the acclaimed Sins of the Wreckers appearance. Ravage, Laserbeak, and Stakeout are new molds, though Stakeout shares engineering with Roadhandler, while Red Heat is a retool of Top Shot. These upcoming Micromasters should be made available in the coming months at retail, and will sell for around $9.99. Check out the reviews below, and let us know what you think of these upcoming Micromasters in the comments section below! And as always, stay tuned to Seibertron.com for all your latest Transformers news and galleries! So, that was actual news? -Kanrabat- wrote: So, that was actual news? I watched this video earlier today, and I could have sworn it was uploaded 1 or 2 days ago. Yes it was news. We waited until the other Micromaster review was posted as well, since Emgo does do his reviews by class size back to back, so we could have the entirety of wave 2 in 1 story. I want that Laserbeak, but Ravage is fugly. The code website says Wave 2 is slated for April when you click on the locked entries. Also, welcome aboard mate, pull up a chair and stay a while. Some of us don't bite. Until we got news of a possible voyager Apeface, we knew the later waves of voyagers for the Transformers Siege line would at least have Thundercracker and Springer. We did not know for sure if they would be in the same wave or not and who they would be packed with if they were not in the same wave. Well, thanks to listings from Robotkingdom, we now know that they will be in two separate waves and each time accompanied by a repacked voyager. It will be Starscream for wave 3 and Megatron for wave 4. The info for wave 3 and 4 are below and link to the listings. Also, to help those who asked, the waves are meant to line up with the quarters of the year. We already know this is not what has happened but to give an idea of when waves could be found on shelves, wave 2 would be in April, wave 3 in July and wave 4 in October. Generations 2019 Siege Voyager Wave 3 set of 2 (STARSCREAM, SPRINGER). Preorder. Start Shipping on 1st July 2019. Generations 2019 Siege Voyager Wave 4 set of 2 (MEGATRON, THUNDERCRAKER). Preorder. Start Shipping on 1st October 2019. Hey remember 2 years ago when someone told all the news sites how we’re getting 2 beast wars box sets? One maximal box set with primal that’d be retooled from POTP apeface and a predacon box set with Megatron that’d be retooled from POTP snapdragon? And the dude who told all the sites said he saw them first hand because he worked for Amazon and nobody questioned the credibility even though it all came form 4chan and we didn’t know the gimmick to POTP? Randomhero wrote: Hey remember 2 years ago when someone told all the news sites how we’re getting 2 beast wars box sets? One maximal box set with primal that’d be retooled from POTP apeface and a predacon box set with Megatron that’d be retooled from POTP snapdragon? And the dude who told all the sites said he saw them first hand because he worked for Amazon and nobody questioned the credibility even though it all came form 4chan and we didn’t know the gimmick to POTP? Why are you bringing this up now? Is it related to the discussion at hand? We are as confused as you are. We know a listing exists labeled for this line and thats about it. We will let you know when we know more. This honestly makes me wonder about how accurate both the Apeface and Astrotrain rumors/listings were. Both of them being in the next part of the trilogy makes a lot more sense to me. Randomhero wrote: Hey remember 2 years ago when someone told all the news sites how we’re getting 2 beast wars box sets? I’m just saying that maybe rumors news don’t need to be front page news. Thread talk? Sure. Some rumors are on spot and then there’s ones that arnt. Yeah dude on 4chan said he worked at amazon and saw photos of these things and would be out wnd of 2017 and people were flipping out. Explained how every figure looked and worked and said previous figures would be included like Legends Blackarachnia and none of it made any sense. I definitely agree that stuff from 4 chan might not be the most helpful but the astrotrain and apeface are a different beast. They are listings from an actual collectables store, so there is evidence for them coming. Like someone said, it might be mislabeled. But its still real news in some shape or form and we would rather not deprive people from hearing it. Yeah and Brawn and Gnaw were listed for thrilling 30 and combiner wars multiple times through out the years and didn’t happen for years till the last waves of Titan Returns. It even shows that online retailers arnt always correct or a name is placed for a different figure. We’ve seen those 2 alone so many times that never turned out to be true until it was a con that revealed them not an online listing when we saw they were real. Thing is, that rumor came about at the same time as another, much larger one, that would confirm WreckGar, Abominus, and Predaking, all much later than the rumor came about. Its entirely possible the 4Chan rumor was them blowing smoke, and this Apeface is just coincidental. Occam's Razor would certainly point that way. But its also entirely possible the rumor was for a prototype Apeface that was still in early early development and then got cut from the Prime Wars trilogy when the lines were shortened. We know things get left behind. And remember too, how long did we know about a Walgreens WreckGar before we knew it was going to be a Groove Retool. That was quite a while. 4,684 pages were recently viewed by 692 unique visitors. This page was viewed 1 times on Monday, April 22nd 2019 6:59am CDT. © 2019 Seibertron, Inc. DBA Seibertron.com. All Rights Reserved. Established June 2000. Seibertron.com is owned by Ryan Yzquierdo.